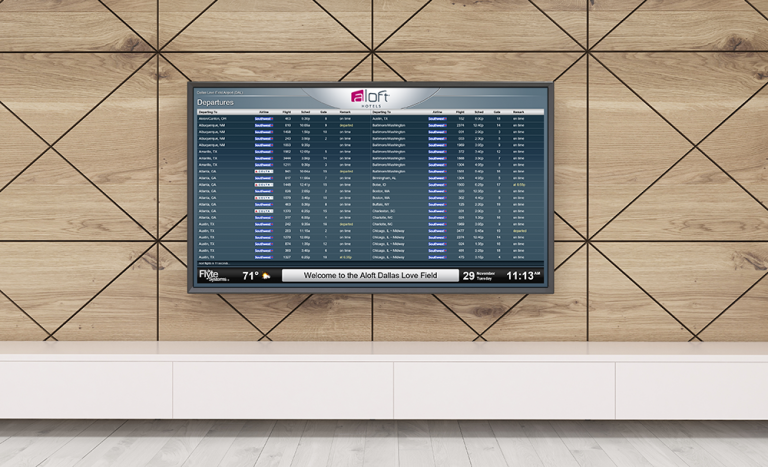 Flyte Systems is the leading provider of subscription-based flight information, wayfinding and event information displays that enhance the travel experience and generate revenue. Brands: Flyte Systems ®, Industrial Television Services Inc. Large-scale cancellations due to weather events and airline shut downs can be a nightmare for hotel staff. Airport hotels become a haven for the stranded, resulting in unexpected floods of distressed travelers. FlyteBoard helps your property anticipate events like these and adjust accordingly. Upon spotting multiple cancellations, augment your staff in preparation for a rush of stranded guests. Live Doppler radar can be included on a FlyteBoard as well, allowing staff to keep an eye on incoming storms. Built and ready out of the box while effortlessly simple to install, FlyteBoard is truly a key-turn solution. We’ll work alongside your team to get your display working quickly & smoothly – it’s as simple as “plug & play”. Then, give yourself a quick pat on the back since your job here is done. We understand that you have many other responsibilities to attend to, and we pride ourselves in taking care of the rest. 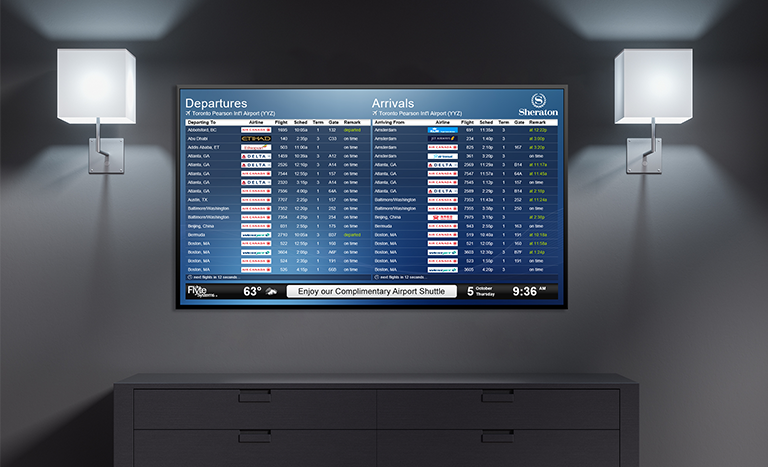 Each of our displays is remotely monitored and supported round-the-clock, ensuring your traveling guests are consistently informed and saving your staff time for other tasks. We are proud to be the trusted provider of flight information for hotels as well as convention centers, corporate headquarters, training centers, parking facilities, passenger terminals, and numerous other businesses catering to air travelers. Contact us today to learn more about how FlyteBoard can boost customer satisfaction, improve productivity, and generate revenue at your location. 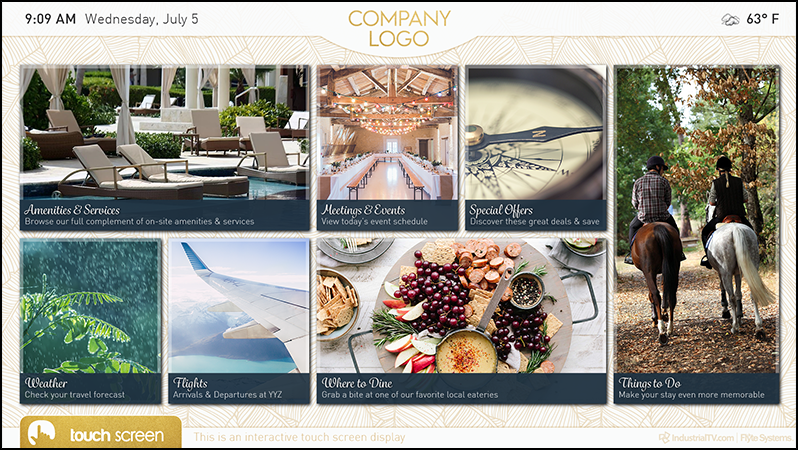 Flyte Systems infobard also can design the presentation to fit the motif and décor of its clients’ locations. “We’re not just a software company that’s providing a tool,” Triphahn says. 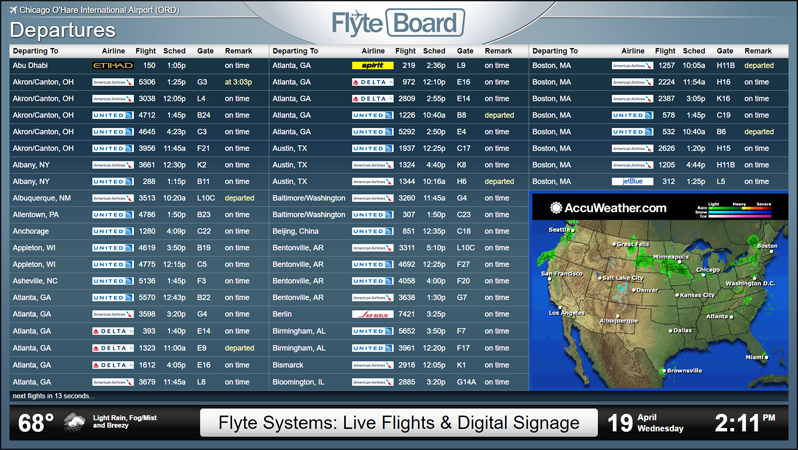 Displayed like familiar airport screens, FlyteBoard allows guests to quickly confirm the status of their flights. Our flight information comes directly from the airlines and airports, so your travelers receive the most accurate updates, 100% of the time. FlyteSystems works alongside your team to get FlyteBoard working quickly & smoothly – it’s as simple as “plug & play.” Additionally, FlyteBoard’s performance is monitored 24 hours a day, 7 days a week, ensuring your traveling guests are consistently informed. Showcasing your on-site services, dining, and retail options, InfoBoard directs traffic to your profit centers. Guests are presented with services and activities hand-selected by your hotel, extending their experience beyond the hotel doors. InfoBoard’s 24/7 availability allows information to be retrieved independently, reducing guest inquiries and saving your staff time. Interactive wayfinding helps visitors to navigate confidently throughout your property. Live event scheduling is an invaluable replacement for traditional paper, allowing you to publish last-minute updates instantly. Pick and choose the modules that benefit your hotel the most. Your display is designed uniquely around your property, creating a tailored amenity that’s one of a kind. Eliminate guest confusion, reduce inquiries, and lessen paper waste with EventDisplay. This scalable signage system displays live event details with wayfinding and can support individual room signs. Information is scheduled through the provided user interface or automated via third-party integration. Allow guests to independently locate their destinations and save your staff time that would otherwise be spent directing visitors. 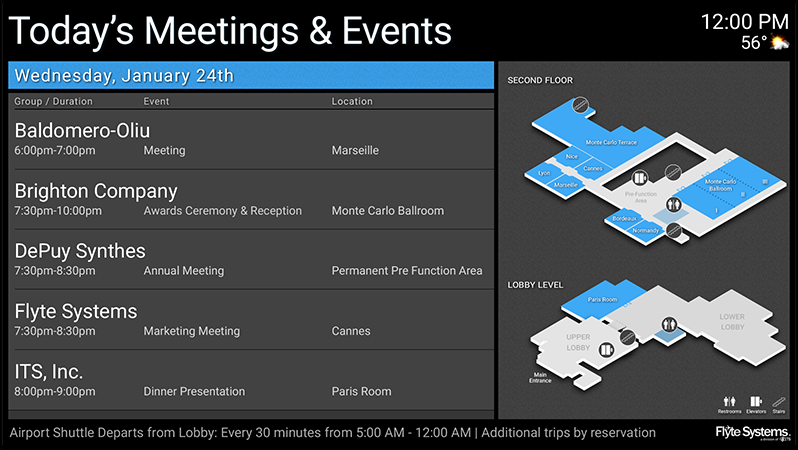 EventDisplay is the simplest and easiest tool for displaying your property's meetings and events!